Operation Christmas Child National Collection Week Begins Now! I can’t believe it’s already here! 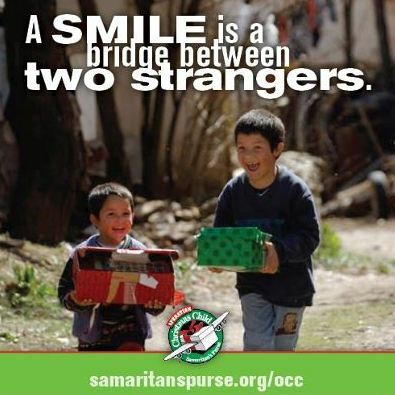 I’m so excited about this year’s National Collection Week for Operation Christmas Child. It’s such a thrill to get to drop off the boxes that we have literally been packing over the past year. But I’m also really excited about today for a couple more reasons. I’m going to my daughter’s school today to help them pack shoeboxes, and to share with them about my trip to Ecuador. I can’t wait to tell her classmates about the children on the other side of the world who will be receiving the shoeboxes they are packing today. How fun! This Christmas season, Samaritan’s Purse and Operation Christmas Child are celebrating the giving of more than 100 million shoeboxes by hosting the “100 Millionth Box Tour.” This is a really special kind of national tour, with stops all around the country, as the 100 Millionth Shoebox will be packed. At each stop, an item will be placed in this very special box. The national tour will stop in my hometown today, and several of the folks that went to Ecuador with me will be here for this event. I cannot wait to witness this incredible moment, as we acknowledge the significance of this wonderful, life-changing ministry that has done so much in the Name of Jesus–using a shoebox. If God can use a shoebox, that means He can use you and me, right? Check out this FREE printable download of 101 Christmas items you can include in your Operation Christmas Child shoebox!